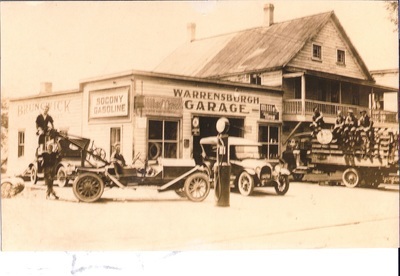 The Warrensburgh Garage was at one time located near the Warren House. In 1912 the business moved to a building owned by Lewis Everts on lower Main Street. At this time the business was owned by Fred W. Hall and Edson Granger. In 1914, Fred Hall left and joined the Haskell Brothers grocery business. It was likely that William Hastings became a partner near this time so that when Edson Granger sold his half of the business in 1917 to Erle Reirden the partnership of "Reirden and Hastings" was left. By the following year, 1918, William McElroy had joined the business and the firm of "Reirden and McElroy" would continue until 1934. At this time it was purchased by James Hastings and Hollis Ovitt, who had worked at the garage previously. In 1935 it was destroyed by fire but was rebuilt. They continued to run the garage until 1946 when it was purchased by Walt Pasco of D. E. Pasco & Sons, who made extensive renovations to the facility. 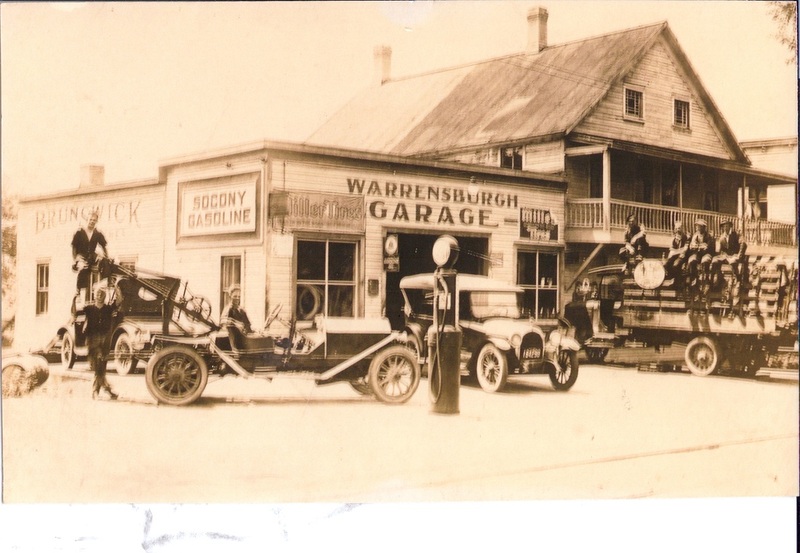 It was that year that Warrensburgh Garage became an authorized Ford dealership. 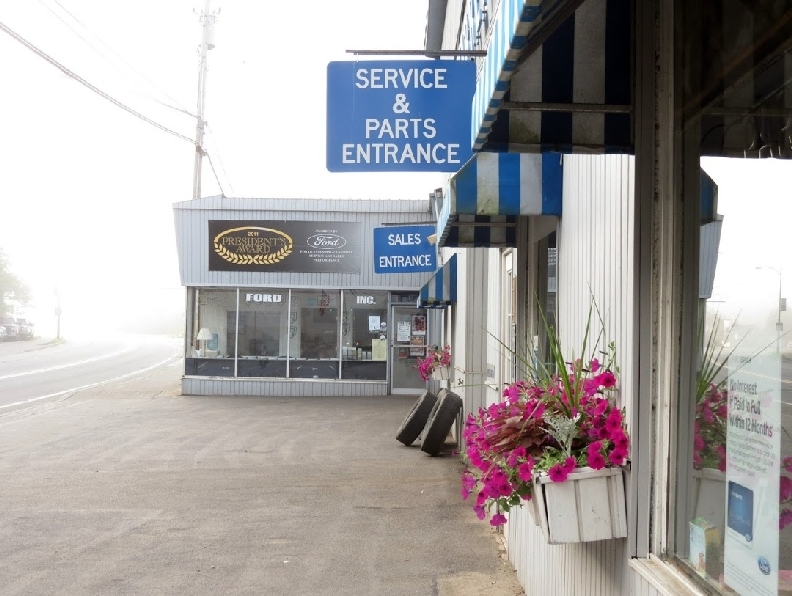 Warren Ford - In 1982 Carmen Maciariello, of Schaghticoke, with 15 years experience in the car business, bought the Ford dealership on lower Main Street from Walter Eichler and renamed it Warren Ford. The property now extends along both sides of Main Street from the Judd Bridge north to Miller Art & Frame and the former Mixter blacksmith shop opposite. 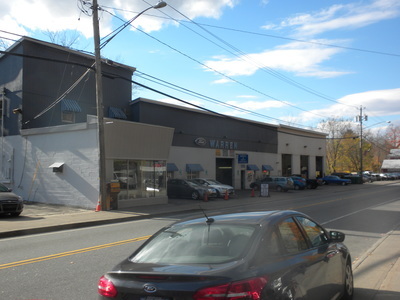 Originally known as Warrensburgh Garage since the 1920s, Eichler had purchased the dealership from John Hickey in 1964. The dealership is now managed by Carmen’s son, Matthew. John Hickey, born in Plattsburgh in 1928, opened Hickey Ford in January 1955 on lower Main Street. (Previously it had been D. E. Pasco & Sons Warrens-burgh Garage, currently Warren Ford). In 1959 he and his wife Mary had a ranch-style home built on the site of the former Hart Joseph residence at 46 Elm Street. He became very active in Kiwanis, and especially involved with the development of Blister Hill. He served on the Warren County Committee for Gore Mountain Ski Center. Hickey was appointed as temporary postmaster on Sept. 1, 1962, after Stewart Farrar's retirement, and served until October 1, 1963. He sold the Ford dealership to Walter Eichler in 1964.